soul | SOUL OF SYDNEY FEEL-GOOD FUNK SOUL DISCO vibes & beyond. We are seriously loving the fourth installment of ‘This is not an Edit’, a digital complication of all Australian Soul, Funk & Disco edits, hard crafted by some of our favorite local DJ’s, Producers & Edit maestro’s. Check out more from the legends at soundcloud too, check out the other Tasty tunes by some of Australia’s choicest DJ’s and Producers. Highly recommend from one of Sydney’s undisputed kings of the Soul & Funk edit and one of our favorite local selectors too. We are so honored to be able to host the first Soul of Sydney set from our good friend and one of our favorite local DJ’s earlier this year.. Sydney’s unmistakable king of the FUNK EDIT, JR DYNAMITE absolutely blessed us with a killer set of party jams including an eclectic mix of 80’s Hip Hop & Boogie, Dance Hall vibes & a heavy dose of Disco Funk Goodness thrown in for good measure. – THINGS I DO FOR YOU – ? Local Sydney DJ/Producer, JR.DYNAMITE, has been bringing his special flavour filled, filtered DISCO, ballin’ SOUL, festive FUNK, nostalgic HIPHOP, rootsy REGGAE and Latin BOOGALOO to welcoming ears for over 20 years. Over the past few years he has burst onto the re-edit/production scene locally and internationally scoring a 7″ release on popular indi funk label, Wah Wah (UK), which hit top 10 in the digital Hypem internet charts. Amassing a large, devoted group of followers, whom await eagerly for their regular hit of aural pleasure. In demand locally and internationally, he has toured extensively throughout Mexico, Ibiza, Jersey, Brasil, England, Montenegro, Germany, Italy, Thailand, Australia and New Zealand, supported a stack of local and international acts including Major Lazer, Coldplay, Mark Ronson and Rudimental with Funk Ferret (NZ) exclaiming ‘that boy is a total pro at getting the dancefloor pumping’. Keeping himself busy as Channel V’s resident promo dj, he also holds down current rotations at some of Sydney’s finest establishments. Catch JR.Dynamite Edits holding it down at SOUL OF SYDNEY 4th BDAY SPECIAL on SUNDAY DEC 6 from 12pm at a NEW indoor / outdoor location with the help from some of Sydney’s finest. SOUL OF SYDNEY: 4th Bday Special | Sun Dec 6 from 12pm. An afternoon of FEEL-GOOD FUNK, SOUL, DISCO, OLD SCHOOL PARTY JAMS, AFRO-BEAT & BEYOND. #GenerationNuSoul is proud to present The Rebirth Of Fresh, an exploration through iconic music. The Rebirth Of Fresh is a new fortnightly event held at Ginger’s in Darlinghurst that sees Sydney’s freshest musicians and vocalists tap into their creative expression and push sonic boundaries as they interpret an iconic producer’s body of work. With a new producer to deconstruct each month, a different guest vocalist each week and alternating between two house bands, The Rebirth Of Fresh will take the audience on a unique trip each fortnight. In October we launched The Rebirth Of Fresh with flare by paying tribute to and reinterpreting Stevie Wonder’s ‘Songs In the Key Of Life’ double album with featured vocalists Wallace Gollan and Jeremy Gregory. November will see Tully Ryan (drums), Joel Jenkins (keys) and Eric Fortaleza (bass) putting their nu soul and jazz spin on the work of prolific R&B and pop producer Kenneth ‘Babyface’ Edmonds. Babyface is a 10-time Grammy winner with 11 solo albums of his own. Throughout the 90s it was close to impossible to have not heard a Babyface composition, with his impeccably crafted explorations of love, romance and relationships making an imprint on the evolution of contemporary pop music throughout the world. To put it in perspective, Babyface has been behind over 125 Top-10 R&B and Pop hits, 42 #1’s R&B hits, and 51 Top-10 Pop hits (including 16 #1’s), and worked with the who’s who of the music world including Whitney Houston, Boyz II Men, Bobby Brown, Madonna, Mariah Carey, TLC and Toni Braxton. After a phenomenal show on November 7th with Ron E Jones, the Rebirtjh Of Fresh is back on FRIDAY NOVEMBER 21ST with guest vocalist Glenn Lumanta! The Rebirth Of Fresh: Reinterpreting the work of Babyface will be a night paying tribute to an icon of 90s R&B and pop by adding a heavy dose of contemporary to the mix. Think Babyface meets Robert Glasper, as the band take the audience on a aural exploration that will leave the audience yearning for more. With an entry price that’s little more than that of a cup of coffee, Sydney’s music lovers will be ensured a night of genre-defying music that delivers more of a buzz than their morning caffeine hit. We put this tribute together back in April to pay homage D’angelo and it caught fire pretty quick, with over 13,000 listens just on soundcloud alone. The mix was put together to showcase the phenomenal work from one of the finest soul artists of our generation who will be playing a highly anticipated show at SOULFEST tomorrow with the likes of Aloe Blacc, Maxwell, Common, Mos Def. Check out the mix and be sure to check out the inaugural SOULFEST festival tomorrow, info below. It looks like the weather has cleared just in time for the highly anticipated inaugural SOULFEST: Neo-Soul & Hip Hop festival. We can confirm we will be throwing down some vibes as Soul of Sydney DJ’s in between sets on the SPOTIFY stage & we also have a handful of the last GA + VIP hardcopy industry tix for sale for anyone who hasn’t snapped tix up yet. Fresh off rockin’ the last two Soul-of-Sydney Block Parties, Sydney’s funky party duo CMAN & JUZZLIKEDAT are back and ready to thrown down another night full of fat beats at Play Bar in Surry Hills… The guys have played at 3 jam-packed parties at Play and it’s always been off the hook 🙂 We’re talkin’ a AAA kinda party; the tunes are awesome, the vibe is awesome and most importantly, the people are awesome. 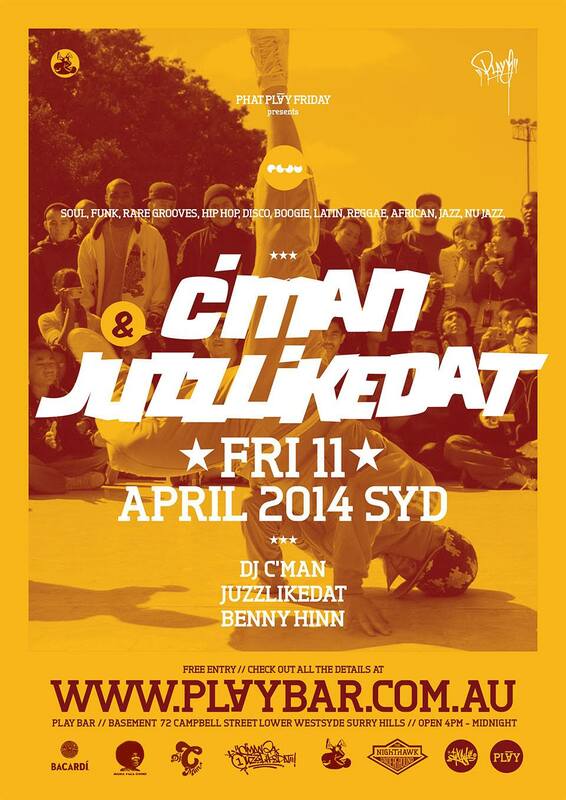 Check out their pages here: CMAN & JUZZLIKEDAT and join us for a night of FUNK, HIP HOP, JAZZY BREAKS, AND SOULFUL ANTHEMS. Visit MAMA FEEL GOOD FUNK COLLECTIVE for more Sydney events, news and happenings. Kenny Dope in control for this classic Roller Boogie 80’s mix.